Unfortunately, gum disease is one of the most common conditions to plague adults in the United States. According to the Centers for Disease Control and Prevention, 47.2 percent of adults aged 30 and older have some form of gum disease. Gum disease is also considered the number one cause of tooth loss, making it an even bigger threat for older adults. Laser technology has found its way into the medical field for several decades now, namely for eye doctors and oncologists. But now, laser dentistry is making inroads by offering people a more comfortable dental experience overall. In the past, dentists would use metal instruments in order to perform basic periodontal therapies, such as scaling and root planing, to remove dental plaque and allow gum tissue to begin reattaching. However, these tools would often result in longer healing times and create a generally uncomfortable experience, so much so that people would skip treatment altogether. Now, the Solea laser allows dentists to manage gum infections, remove dying tissue and other materials that damage the gums, all without the need for metal dental tools. What’s great about the Solea laser is it doesn’t sacrifice any effectiveness just to improve comfort. Dentists can treat gum disease less invasively and more quickly than ever before with laser dentistry. It’s worth mentioning that laser dental tools allow dentists to be far more precise than ever before. In the past, metal tools would make it more difficult to maintain natural gum structure. This would often result in removing too much tissue unnecessarily. 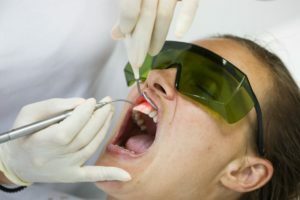 The next time you need periodontal therapy performed, you shouldn’t have to settle for inferior methods that only make recovery longer and have no added benefit. Schedule an appointment with a dentist in Inver Grove Heights today to get the treatment you deserve! Dr. Sheryl Tandon earned her DDS degree from the University of Iowa College of Dentistry. To her, dentistry has always been more than simply a career choice, but a path to help people smile, improve their oral health and create a comfortable dental environment. To learn more about her practice, you can contact her through her website.